To say my writing has been greatly influenced by the Star Wars Expanded Universe is probably the understatement of the century. Now looking at my current WIPs list, this might be hard to see based off of the vague explanations and descriptions. If anything, SPIRIT RIDDLED is more of a fantastical X-Men (though I only recently realized this). THE DESCENT OF CHRIS CHAPPELL is basically Harry Potter from Voldemort's perspective. THE EVERGLOW CONSPIRACY is more of a cross of epic fantasy and a dystopian novel. And my other three projects which are all in their early stages won't strike anyone as having been heavily influenced by Star Wars. So I wouldn't be surprised if any of you are scratching your heads and thinking "What? Mandy's writing has been influenced by the EU?" Note I didn't say my ideas were influenced by the EU. What I mean is my writing style: how I craft words, create plots, and describe characters. I started writing seriously* in the sixth grade, and what you have to understand about sixth grade Mandy is that she only read Star Wars books. That year I read Star Wars exclusively. I started with the Thrawn Trilogy in the fifth grade and slowly consumed the entire EU. Sixth grade was also the year The Phantom Menace came out and the EU opened up to the years right around that movie as well. (The EU originally only contained stories that took place after A New Hope). Star Wars was BIG. It was still socially acceptable (since the prequels hadn't destroyed it), and I applied the same level of fanaticism to the Rogue Squadron that most girls my age applied to boy bands. So while everyone else knew the names of everyone in N*Sync and the Backstreet Boys, I could have told you how many kills each member of the Rogue Squadron had. So it should be of no surprise to anyone that the first story I ever tried to write was essentially a Star Wars fanfic. Granted, I didn't know what fanfic was at the time, and still didn't recognize it as that until after college. It's the only piece of fanfic I've ever written, and it contained all original characters with a cameo or two by Wedge Antilles. (It sort of surprises me in retrospect that more Star Wars characters didn't cameo). The story was at it's heart a military school story, about a bunch of kids in a military school (on Coruscant, so this is after the New Republic took control of Coruscant) hoping to be X-Wing pilots or Fleet Admirals one day. So I shelved that Star Wars EU story and in my middle school years I wrote three more books: two which were fantasy novels and one which was another military school novel (but this time in an original setting). The two fantasy novels are really terrible. Like truly. Looking back at them, I sort of cringe and want to burn them. But when I look back at my military school novel (called PROJECT EF), that's the time I mark as me coming into my own as a writer. My writing in high school took a turn for the almost exclusively epic fantasy, which is what has pretty much led me to where I am today. 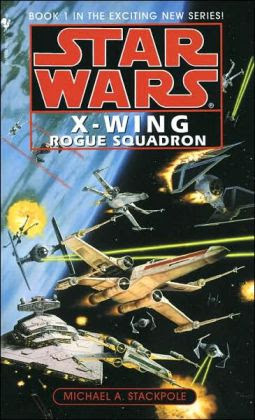 So anyway, recently, I started re-reading the X-Wing books. I want to re-read I, Jedi, which I remember fondly as one of my favorite Star Wars EU books of all time, but I wanted the full emotional impact of having seen Corran's relationship with Mirax develop over the X-Wing books. So I set aside all my other reading and picked up Star Wars X-Wing: Rogue Squadron, which I haven't read since the sixth grade. As I was reading it, I had a revelation; my writing and reading habits (for good and for ill) can be traced directly back to the Star Wars expanded universe. So in the next few posts we're going to talk about these things I've realized. I'm not sure all the topics I will explore but I know at least two. So look forward to me talking about (1) My Problem with Action Sequences and (2) Character Descriptions and "the Male Gaze." *Ok, feel free to laugh at the use of the word "seriously". (It was after all the sixth grade). What I mean is that that's when I started writing epic, long stories for myself, where I wrote at regular intervals (daily), created original characters, and started paying attention to how exactly I set up stories and the like.